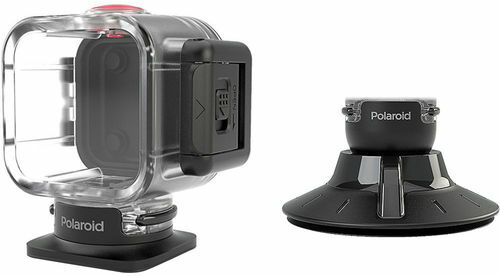 The Waterproof Case and Suction Mount from Polaroid combines a waterproof housing rated to depths of 33' and a suction cup mount, both designed specifically for the CUBE action camera. The housing features a durable plastic construction and an integrated quick-release clip for attaching to the suction cup mount, as well as other optional CUBE mounting accessories. The camera platform on the suction cup mount is tiltable, letting you adjust the cable angle and position to get the best shot.